During his political career, Rob Muldoon developed a good relationship with some gangs, especially Black Power, helping them to find accommodation and form work trusts. They treated him with respect, and Black Power performed a haka at his funeral. Thea Muldoon visited the Black Power marae in Wellington after a memorial service for Muldoon at Wellington Cathedral in September 1992. 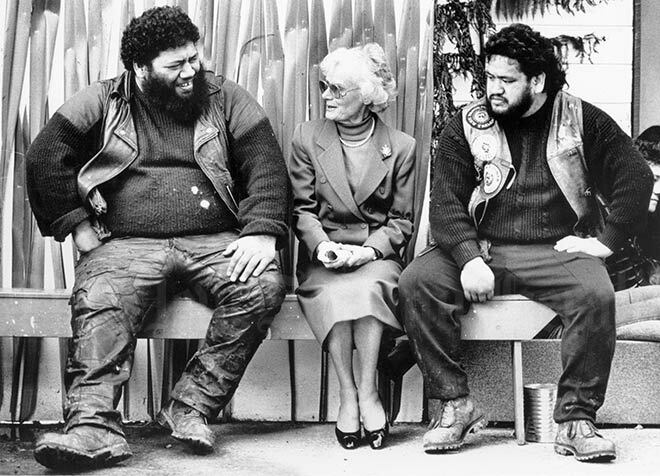 She is shown seated between Bumpa Mahauraki (left) and Lani Clark.